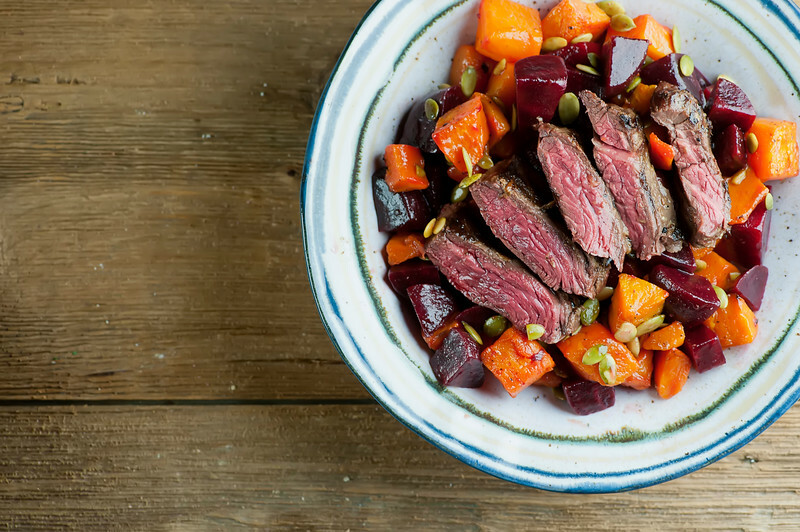 This easy recipe for butternut and beet steak salad is full of hearty fall flavors, perfect for those early autumn suppers. Well, we have definitely flipped the calendar over into fall, but as much as I will miss the basil and tomatoes and corn, that doesn’t mean we can’t have delectable fresh and local veggies for supper. 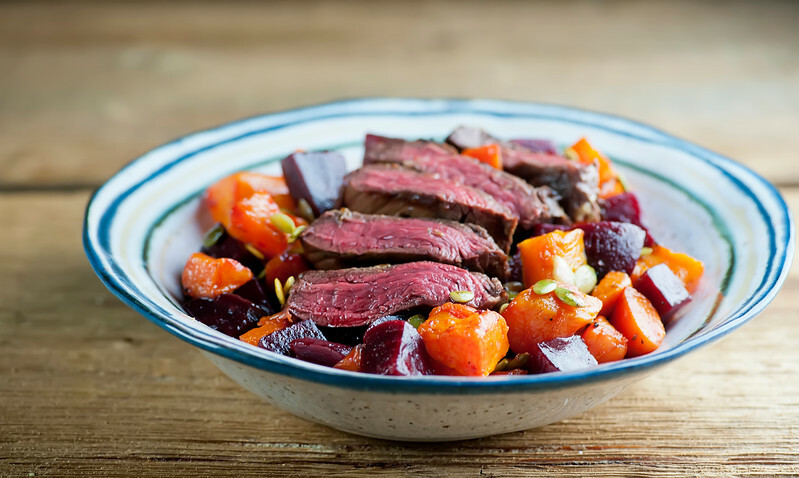 And in the case of THIS supper, I’m talking about roasted butternut squash and sweet tender beets, tossed with a little vinaigrette and topped with slices of flavorful hanger steak. So if you are starting to feel like autumn eating but aren’t quite ready to leave the salad days behind, this is supper for you. Let’s make it! First off, let’s talk hanger steak. Hanger steak is my new favorite cut of steak – it’s got a deep rich flavor, it cooks up in a snap because it is usually a thin cut of steak, and it’s usually much more affordable than other cuts of steak. I love it for my beloved steak frites recipe, but it’s also super in this salad. I’m also here to tell you that I am not ashamed to take all kinds of shortcuts with the veggies. My local market sells already peeled and cubed butternut squash, and if you have ever done battle with an un-peeled butternut squash, you know what I am talking about. Here’s a link to how to peel a butternut if you are braver than I am. As for the beets, my usual approach is to ask my mama to roast me up some beets, and here’s a link for you on roasting beets if you want to try it at home. 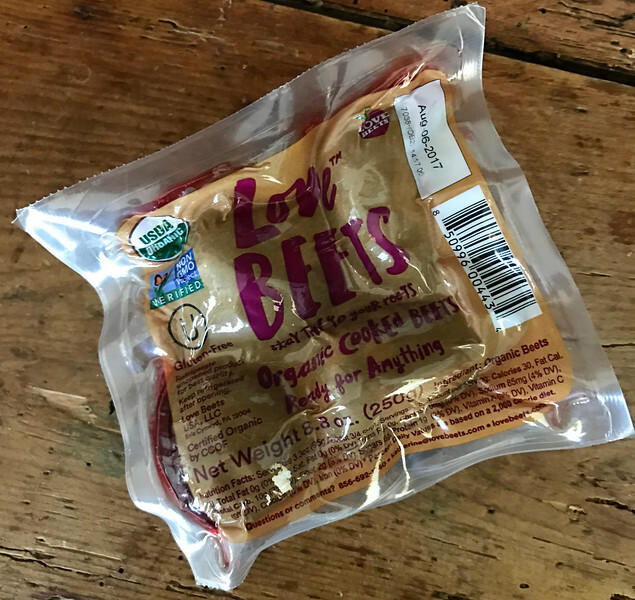 Lately my same market has been selling these cute packages of already peeled and cooked beets. So. Worth. It. Now all you need is a nice vinaigrette dressing and a handful of pumpkin seeds, along with a few things to marinate your steak in. When dinnertime rolls around, you are going to roast up those butternut squash cubes until they are nice and tender, and grill and slice the steak. Toss your veggies with the dressing and the pumpkin seeds, divide it among plates and top it with some of that super flavorful steak. Hello, you gorgeous fall veggies you. Happy autumn cooking! Combine mustard, garlic, lemon juice and zest and 2 tablespoons olive oil and rub it over the steak. Let it marinate in the fridge for at least 2 hours. Preheat oven to 400 and line a rimmed baking sheet with foil. Toss butternut cubes with the rest of the olive oil and a pinch each of salt and pepper. Roast until tender, about 30 minutes. Turn grill on to highest setting and grill the steak for 1-2 minutes per side for rare to medium rare (or longer if you like your steak more well done). Let the steak rest for 5 minutes. Slice the steak against the grain into slices. Gently stir squash and beets with dressing until lightly coated. Add pumpkin seeds (if using) and stir again. Divide squash mixture among plates, top with steak slices and serve. I am always looking for something to do with butternut squash – thanks for this idea!